Construction has begun on a new sculpture park on the southern edge of the University of Notre Dame’s campus. 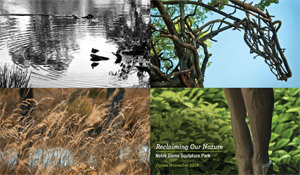 Situated in a wooded, 8-acre dell that lies between the Irish Green and the Compton Family Ice Arena, the new park is a project of Notre Dame’s Snite Museum of Art and the office of the University Architect. It has been designed by the landscape architect Michael Van Valkenburgh, whose prior designs include the Allegheny Riverfront Park in Pittsburgh, Mill Race Park in Columbus, Ind., and Teardrop Park in downtown Manhattan. The park will be completed in late fall. In addition to its provision of public space for the contemplation and enjoyment of nature and art, the new park will be available as a venue for occasional academic class sessions, poetry readings and musical concerts. The inaugural theme of regeneration is particularly appropriate for the site, a former landfill with a pond formed by runoff water from adjacent parking lots. Indigenous flora, including trees, shrubs and prairie grass to be planted later in the summer, will help restore the area to its natural state and obviate the need for irrigation, fertilization, chemical spraying and annual pruning. Originally published by Michael O. Garvey at newsinfo.nd.edu on August 20, 2012.